Choo! Choo! Here are some train related educational activities to supplement a family train ride in Sri Lanka. 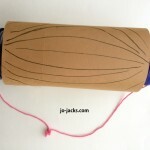 Here is a cute and easy train craft that can also be used to teach colors of the rainbow and the numbers 1-6. I did this with children ages 2-3. I cut out the pieces of paper and wrote the numbers and drew the tracks. 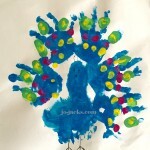 So for the children this is a pasting craft. Ask them to place the numbers in the correct order and say the color. Older children with more cutting capabilities could cut our the rectangles and circles themselves, as well as draw the tracks and write the numbers. They could be challenged further by doing times table numbers on the trains. Or you could use letters instead of numbers and have the train spell a child’s name. Choo-choo. Peanut butter – SQUISH! Build the Bridge. This is a fun online game that challenges children to build a train bridge so the train can move left to right from abcya.com. It is more appropriate for older children and I will admit to finding it a fun challenge myself! 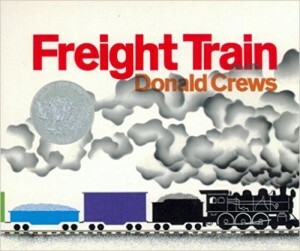 Here are some train related educational books that are fun too. 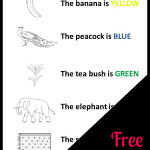 Great book for learning colors – simple and fun. 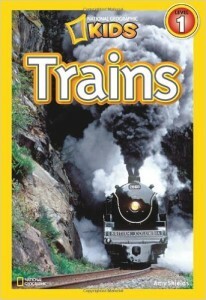 More informative book for children 6-10 and avid train lovers. For my story on my family’s wonderful train ride in Sri Lanka, click here.